Thanks to the heads up from Hisstank, it appears that a new GI Joe trailer is on the way! The trailer is 2 minutes and 24 seconds long. It is likely that it will be released before another Paramount movie titled "The Dictator" which is out on May 16th. Hopefully we will see some new shots of Joe's character Mouse in the new trailer! GI Joe Retaliation will be out in theaters on June 29th. White House Correspondents' Dinner tonight! NEW GI Joe Retaliation trailer TONIGHT! More "First Kiss" Festival news! 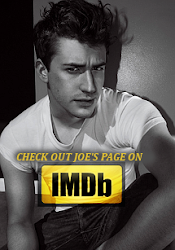 Love Joe Mazzello is not affiliated with Joe Mazzello or his management in any way.